I would like to know your opinion about a PCR I made. I attach the image of the gel. I wanted to amplify a gene of 675 pb from a miniprep I made from a vector I subcloned. 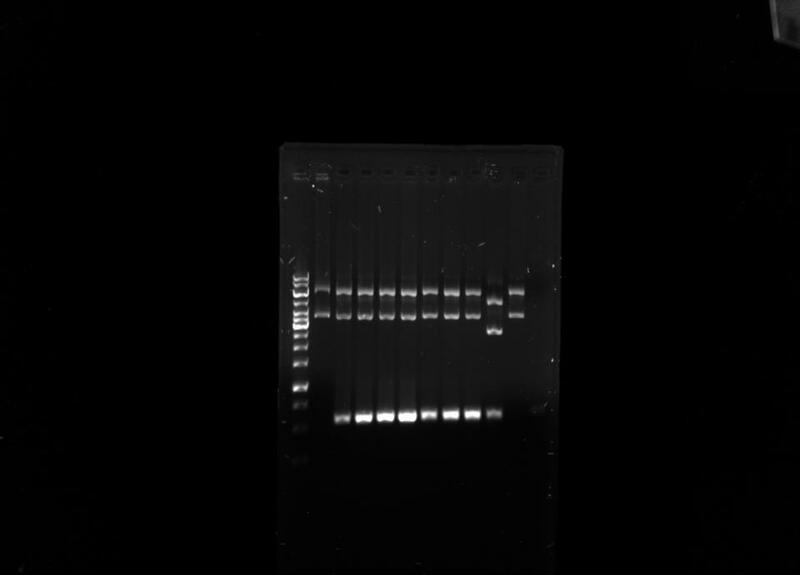 The first lane is the ladder (I used the 1kb from Thermo Fisher), the 2nd to the 10th lane are my samples, the 11th lane is the negative control without taq and the 12th lane is the negative control without DNA (I used water as the template). I see a weak band in the last lane, I don´t know if it is due to contamination because the bands of my samples look stronger and one sample did not amplify anything. What do you think it could be? Should I repeat the PCR again? Edited by liligompac, 27 May 2018 - 01:29 PM. It's a bit confusing that the ladder isn't labeled. Thermo makes a few different 1kb ladders. I'm assuming the band at the bottom of the gel is the desired band. I find it's easier to determine weak bands if you invert the image (i.e. black bands on a white background). Most imaging software allows you to play with the image so you can distinguish actual bands from false positives. If you saved the original image, you might be able to go back and play with the inverted image. You also seem to be having an issue with the dye front. The pigment of the dye can sometimes obscure the band. Your dye front seems to be just under the desired band. It may be obscuring the band in the no-template control (NTC). I'd rerun the gel and take an earlier image (if you're careful, you can put the gel back in to continue for the full time). The ladder won't be as distinct, but you'll see if there's a true band in the NTC. The point of the NTC is to control for contamination. You can't trust any downstream applications if the NTC is contaminated. Besides, if you have inadvertently contaminated one of your reagents - you want to know ASAP. If this is for legitimate research, you really should rerun the gel. If you think it might be contaminated, you only need to run the NTC reaction - before wasting any more template. Yes, the band at the bottom is my desired one. I inverted the image, but it sees the same way. But the point is that I always made my negative controls first, then the master mix., the I added the master mix to the respective tubes and the samples at last. But the curious thing is that one sample didn't amplify anything, and I use the same reagents. So what you suggest is that I should made the pcr of the ntc reatcion again? or only rerun the gel with the same pcr products? I need to ask what are the two larger bands in your samples lanes? Are they leftover plasmid template? If so, you are using way too much template in your PCRs, and using too much can make it easy for contamination to occur. For plasmids, a few picograms/rxn is sufficient; you do not want to see leftover template in your product. What is the purpose of the PCR? Are you screening to see if you got an insert? Does it indicate correct orientation of the insert (one primer in the vector and the other in the insert)? What is the downstream application of these PCRs? Did you know you can screen for inserts/orientation directly from transformed colonies? All you need to do is pick up a bit of the colony (you don't need much) with a sterile toothpick and swirl it in a microtube with 50 ul dH2O, then amplify 1 ul of the bacterial suspension as template. (I am assuming you are using E. coli here). The heating of the PCR rxn will break open the cells and the DNA inside will be amplified. No need to pre-treat. You should use some bacteria without plasmid as one of your negative controls. With this method, you can skip making plasmid preps until you have some positive candidates as indicated by your PCR. Yes, it's leftover plasmid template, I used 2 microlitres of the template for a 25 microlitres reaction per sample. But I don't understand how you said it could get contaminated. The first step I made was doing the negative controls, then I made the master mix, then I added the master mix in each tube per sample and at last I added the samples (2 microlitres of the different minipreps I had). Yes, the purpose of the PCR is to screen an insert in a plasmid I want to use to produce a recombinant protein. Thanks for your suggestions about the PCR colony! Ok, if you've already made the plasmid preps, you can screen by running restriction digests on them to screen for presence of the insert and its orientation. Then you don't have to worry about negative control amplification at all. I use the colony-PCR method anytime I suspect my success rate with the cloning will be low, and I'll need to screen a lot of colonies to get a good one. I can do a lot of PCRs in a 96 well plate. Once I detect some positives, I can make plasmid preps from just those colonies and save a lot of plasmid prep reagents, media, and time. Then I confirm those plasmids by RE digestion and sequencing (if i cloned a PCR amplicon) if needed. I save PCR reagents by just doing small rxns-10 ul is big enough.